If you're looking for something to give the person who has it all & gift cards just won't cut it, consider giving a Gift of Canadian Nature (GCN), from the Nature Conservancy of Canada (NCC). GCN features symbolic gifts of habitat for a snowy owl, swift fox, grizzly bear, moose or bobcat. 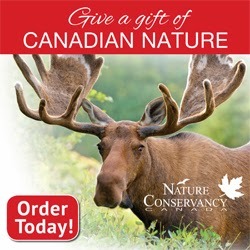 A Gift of Canadian Nature is a great way to avoid the holiday clutter, the shopping malls, & give something meaningful. From the hiker to the rock climber, the photographer to the educator or the armchair nature lover, NCC's Gifts of Canadian Nature are as unique & diverse as the individuals on your holiday shopping list. Every gift includes a personalized certificate plus a 2014 nature calendar full of Canada's most stunning protected places and animals. For some of the many reasons to support the work of the Nature Conservancy of Canada's work, check out the infographic I posted yesterday. Enter below to win a Gift of Canadian Nature yourself! Either the wombat, or the penguin!